We did the Aviva Superfundae in 2015 and 2016. This year, we are going again. And there's only 1 reason why we keep going back, it's FUN! 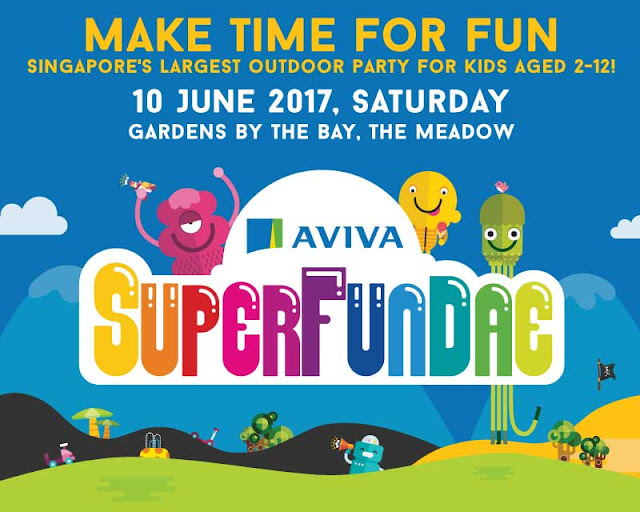 Aviva Superfundae is Singapore's largest outdoor party for the family. It is back on 10th June 2017, bringing you more sunshine and happiness! There will be more than 30 non-stop games and activities sprawled across 22,000 sqm of open play space, await you across five thematically-designed fun zones – Circus Centre, Speedy Zone, Dream Castle, Pirate Island, and Jungle World. In the world of Aviva Superfundae, experience a sugar rush like no other, their Mega Candy Cannon fires Haribo gummies hourly! Channel your inner hero as you navigate Jungle World and complete the Ninja Quest Giant Inflatable Obstacle Course. Get wet and wild at the CrayCraySpray Waterplay Area, take part in awesome (and quirky!) Family Dashes and unleash your inner Picasso! What’s more, every kid will receive a Superfundae goodie bag and Medal of Achievement when you complete all challenges. There will be great entertainment throughout the day and a movie screening, under the stars. But what tops the cake is free ice cream all day long! Not forgetting that cold beer for well-deserving parents too! In our everyday rush, it’s easy to forget to have fun and how good it is to just hang loose and laugh out loud with our loved ones. It’s high time to play with our family, run around silly and overdose on some sunshine and happiness. After all, that’s what amazing memories are made of! Ticket is priced at $19.90 each. It is a one price for all ticket that includes participation to all activities on site. Except for food though. Get tickets here! Kids below 3 years old, enter free. Visit www.superfundae.com.sg for more details. Big Thanks to our kind sponsor. We have 2 x Family Set tickets (4 tickets per set), worth $79.60 per set, for Giveaway to 2 readers. 1 set of giveaway for our Facebook readers and another set for our Instagram followers. 3. Tag 3 or more friends on the comment section of this post, whom you think will be in this funival. 1. Like the corresponding post. 4. Tag 3 or more friends in the comment section, whom you think will be keen in this funival. You don't have to, but sharing this sweet deal is caring! And yes, you may try your luck with both handlers - Facebook and Instagram. Giveaway closes on 19 May 2017, 2359hrs. Best of luck! 2.liked Mum's Calling Facebook page!